I have decided that the only thing more difficult than having training wheels is not having training wheels. Feeling tippy is better than being stuck, or afraid to move. In my current place of growth I am in a ‘tippy place’ where I wobble precariously from one side to the other side trying to find my balance: I am moving forward, and I can feel my own hard work, and every once in a while I get the sensation of what it might be like to not have the training wheels at all, where I can feel open space, where I can glide. And then moments later, I reach towards something new and I feel the wobbliness again. New learning in adulthood is awkward. And learning or re-learning any of the skills of relationship or attachment is really hard. It’s not easy to find your center from the wild swings to the edges. Training wheels can be perfect for learning because you can actually start with them right on the ground—as if you had a perfect third wheel. You get to feel what it is like to sit and steer with the bike completely balanced. Having training wheels lets you incrementally decrease your need to rely on an old source of support so that you can rely gradually on your new skills and sources of support. What is the psychological equivalent to training wheels? The stepwise and incremental progressions of mending a heart and repairing trust? How do you shift a worldview from one that is always vigilant—to one that can relax and lean in to safety and in to relationship? We always want the solution to look more complicated or exciting than it really is. We don’t like to admit how even a small adjustment can make us feel wobbly. So how do we begin? 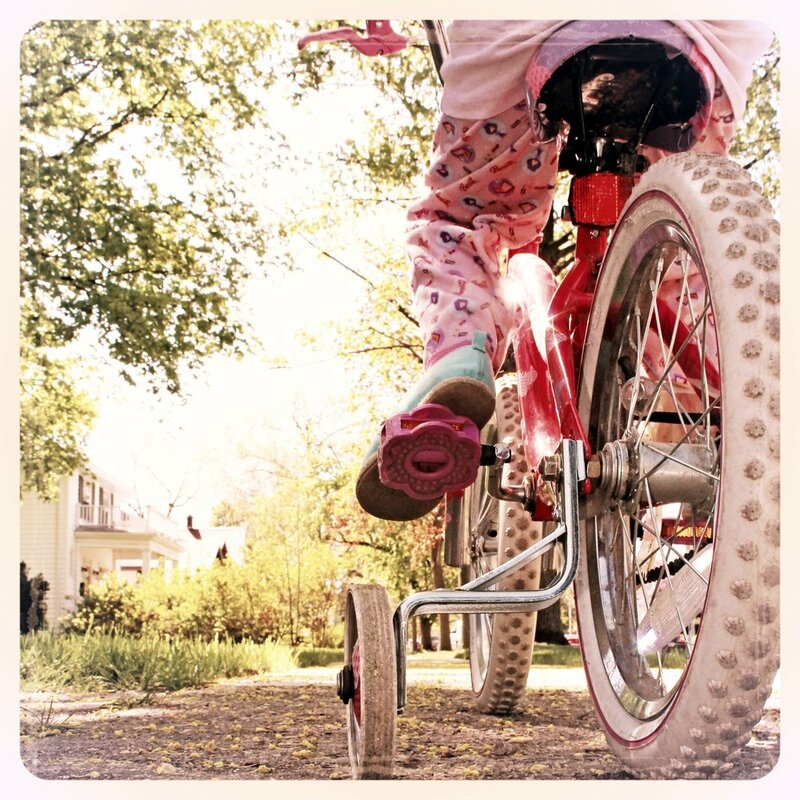 The starting place for creating your metaphorical training wheels is a sense of solid ground. But what feels solid and comfortable? In my book, Journey Through Trauma, I talk about the first phase of healing from repeated trauma as the Preparation Phase. The Preparation Phase is where you work on all of your resources for healing and you find some solid ground for yourself: where you make things more predictable or more routine or more supported than you have ever had, or than you will eventually need. And then as you begin to take in the experience of safety and predictability that you have put in place—not unlike the training wheels set to the ground—you may begin to try to find some new edges of learning. You feel safe enough in a relationship to ask for a need to be met. You risk saying, “No.” You admit how you are feeling. Finding your learning edge in the psychological world than they are in the physical world can more difficult than it is in the physical world because in the physical world you can see clearly what you are using or not using. One of the best examples of this kind of learning comes from Norman Doidge’s book The Brain that Changes Itself, where researchers figured out what it took to bring back full functioning to a person who had experienced a stroke, where the stroke makes impairs functioning on one side of their body. The prevailing treatment had been to work with the side that was not functioning with physical therapy—to teach it to work again. But that treatment had slow and intermittent success—most people reverted to using their ‘good hand’ to do most of the things that they needed to do, and the less functioning hand rarely gained functioning again. Instead, the new treatment intervened by strapping down the good arm or leg with an ace bandage, or putting an oven mitt on it—making it impossible to use the good side at all. In the absence of being able to use the functioning limb, the brain appears to rewire the weaker side and eventually allow a person to gain complete functioning. So learning and healing is not just about what makes you feel more solid or helping you lean in to new learning—it is also about knowing what needs to be unlearned, or unused so new learning can take place. And psychologically, what are those things you need to put your oven mitt on so that you have no choice but to lean in to the new learning? How can we bring these ideas to healing from trauma? For learning or re-learning attachment? We need to remember that repeated trauma, and really, any relational trauma, is really three forms of trauma— what did happen (the trauma that occurred), what you did to survive--the protections you used to survive the trauma, and what didn’t happen— the growth and development you missed. And the work of creating training wheels is twofold—one wheel is like the oven mitt used for stroke patients— it is a set of behaviors that will keep you from using your old protections, and will keep you from following the old rules of survival. By putting a metaphorical oven mitt on your old protections—you will have to lean in to new behaviors and new attitudes. And these new behaviors and attitudes are the other training wheel—the things you may never have tried before. So now you get to practice with the training wheels. You head to one side thinking you can use your old protections but you can’t because you have covered them with an ‘oven mitt’, so you wobble to the other side looking for refuge, and instead you find a new behavior that feels like a risky new behavior—which you try and feel anxious so you lean back toward your protections which you are bravely giving up and you go back and forth –sometimes gloriously finding the center—finding something brand new. I call these moments new beginnings, they are ‘what didn’t happen.’ But how can these moments become woven in, become the new default? I have another example from Norman Doidge’s book, where a woman has severe vertigo from a reaction to antibiotics and is unable to stand or walk. As treatment she uses a helmet that serves as an external vestibular function for her inner ear that has been damaged. When she puts on the helmet she can stand up and stay balanced and doesn’t feel nauseous. That the helmet can support her this way is amazing, but what is really amazing is that wearing the helmet gives residual benefits that increase over time. The longer she wears the helmet, the longer she can feel the benefits even when she takes the helmet off: the helmet re-teaches her brain how to experience and manage balance. And this residual learning mirrors my own experience of psychological training wheels: you get a benefit in the moment of the new learning experience—but if you can stay in it with some constant repetition—you can begin to feel a residual benefit long past the actual practice time. These moments of new beginning give you the brand new experience of growth—and the more they happen, the more of these moments that can get strung together, the more they have residual effects where you can pedal for a while without the wobbliness. Where you carry your center with you. In healing the relational aspects of trauma what I have noticed is that these new moments of growth give me a sturdiness, I can feel my own two feet. They give me a feeling of elasticity— I can feel like relationships have an elastic quality that will allow some give and take, and they give me a feeling of openness and expansiveness where I can look up and around. For me and many people with a history of trauma there is a hyper vigilance that is the constant background noise—the constant operating system running in the background all the time. Finding the tippy place between the two training wheels means living in a place where that operating system isn’t in the background: its acknowledged and worked with. In the tippy place you have owned the protections that keep you from learning a new way, and you have identified the new behaviors that are your learning edge. In the training wheels model you aren’t denying your problem or wishing it away—you are living with it—and working not to use your old protections so that you can try something new.